Achilles tendon ruptures are injuries that are becoming more common as the participation of recreational activities continue to increase. Fortunately, most acute ruptures are identified and treated within the first month of the injury, whether by immobilization or by primary surgical repair. Ruptures are sometimes missed by physicians or ignored by patients and the consequences of the so-called neglected Achilles rupture can be devastating. Surgical repair of neglected Achilles ruptures is less controversial than that of acute ruptures; however, selection of the most appropriate procedure often proves difficult. There have been a number of surgical approaches described to treat the neglected rupture. We present a review of the surgical approaches described in the literature as well as an illustration of our preferred methods. Common symptoms include the feeling of being kicked from behind,  difficulty walking, weakened plantarflexion power,  swelling, and bruising about the ankle. On examination, there may be a palpable gap, [8,19,20] diminished plantarflexion strength, or a positive Thompson test. Ma and Griffith stated that a palpable gap at the rupture site and diminished plantar flexion strength are pathognomonic of an Achilles tendon rupture. Ecchymosis, edema, and pain on palpation may be present on exam. The free fascia lata graft was first described by Bugg and Boyd in 1968. Maffulli described the use of a free gracilis graft for augmentation. The fascia advancement technique was popularized by Abraham and Pankvich in 1974 with the V-Y plasty. The gastrocnemius-soleus turn-down flap was described by Arner and Lindholm in 1959. [2,15,54] Disadvantages of using free grafts include the technical difficulty of some repairs as well as some requiring a separate incision. 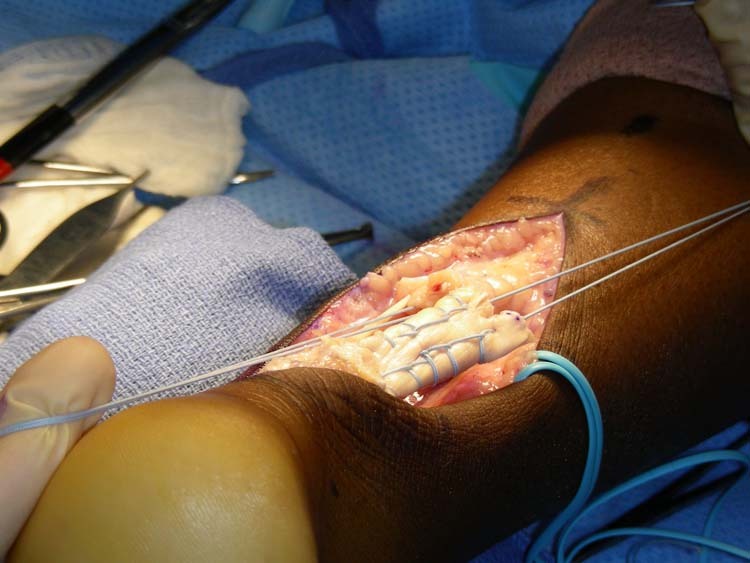 There are a number of advantages to using the FHL tendon transfer. 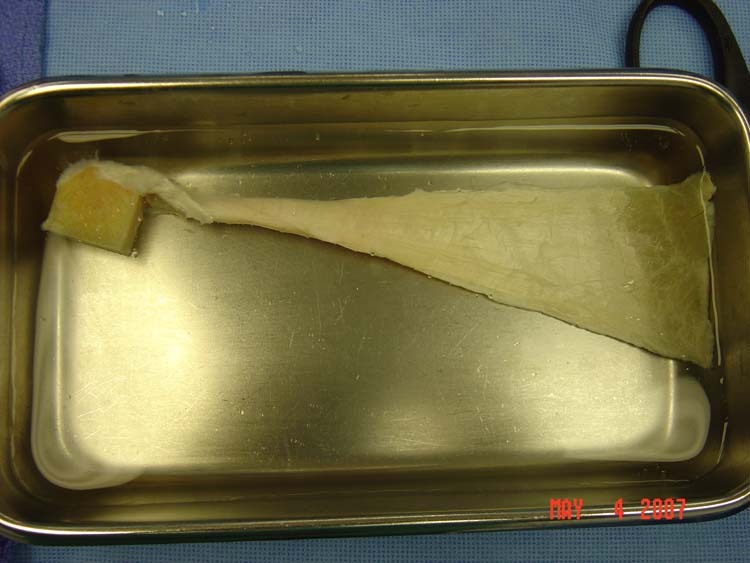 The FHL is stronger than the peroneus brevis  and Leppilahti  stated that the FHL tendon is twice as strong as FDL. The FHL tendon also maintains normal muscular balance that may be sacrificed with other transfers. 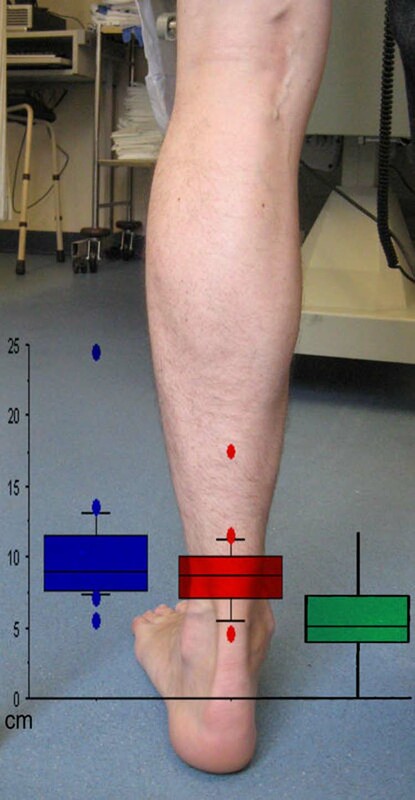 Another advantage is the location of the muscle belly in relation to the Achilles tendon. It extends distally into the relatively avascular area of the Achilles tendon, offering a rich supply of blood. [14,45,47,61-63] As with any tendon transfer, subsequent weakness is a concern. Hansen noted that most patients over 30 years old did not have altered function after the loss of FHL strength. Coull, et al,  discovered residual weakness of FHL function, but found no mechanical differences in forefoot loading patterns between the operated foot and the normal, non-operative foot. 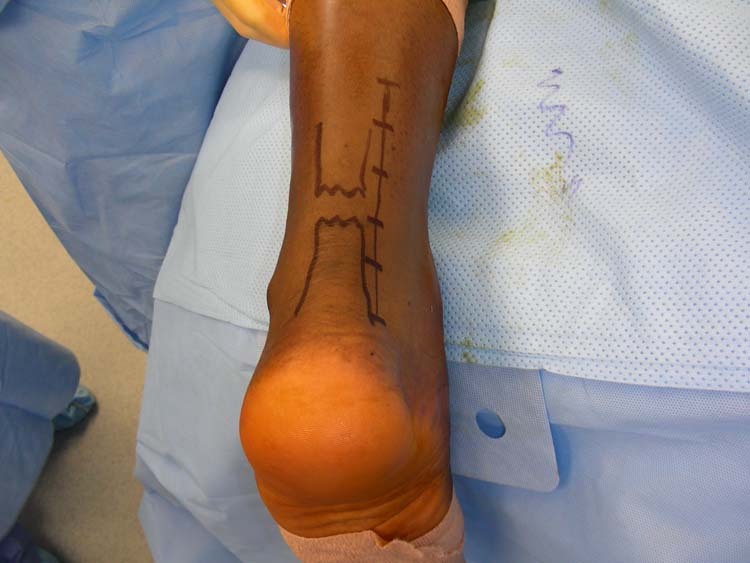 Figure 1 A linear incision is made just medial to the Achilles tendon. This incision allows for adequate exposure while decreasing rate of adhesion formation. 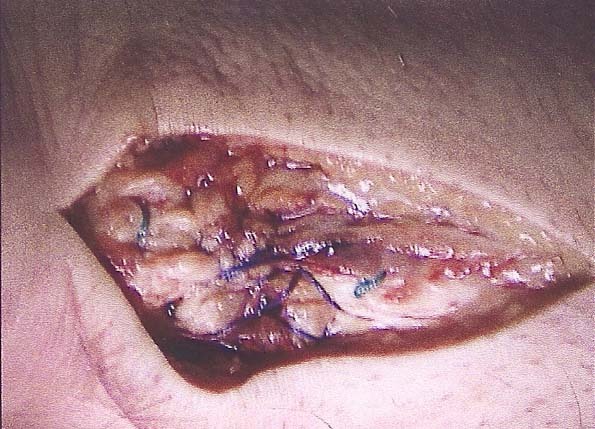 The offset incision of the skin and underlying paratenon allows the presence of 2 barriers to the outside environment. This technique is utilized to offset the incisions of the skin and paratenon to decrease risk of adhesion formation postoperatively. The paratenon is then incised; however it is often noted to be adhered to the underlying post-rupture, tissue fibrosis and this portion is usually sacrificed. Upon reflection of the paratenon at the rupture site, an area of fibrotic tissue is often interposed between the ruptured ends of the Achilles tendon. This is completely resected until normal tendon is noted at the distal and proximal ends. 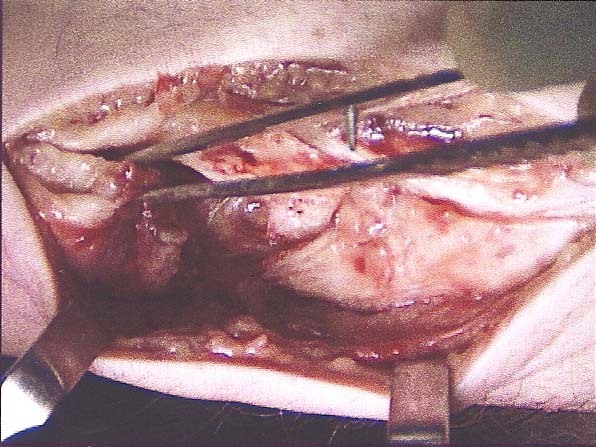 Figure 2 Dissection deep and just medial to the Achilles tendon allows exposure of the flexor hallucis longus tendon. The neurovascular structures lie just deep and medial to the tendon, necessitating the use of blunt dissection in this area. The blue arrow is pointing to the FHL tendon and the yellow arrow to the FHL muscle belly. Figure 3 The drill is driven from the superior calcaneal tuber through the plantar cortex. 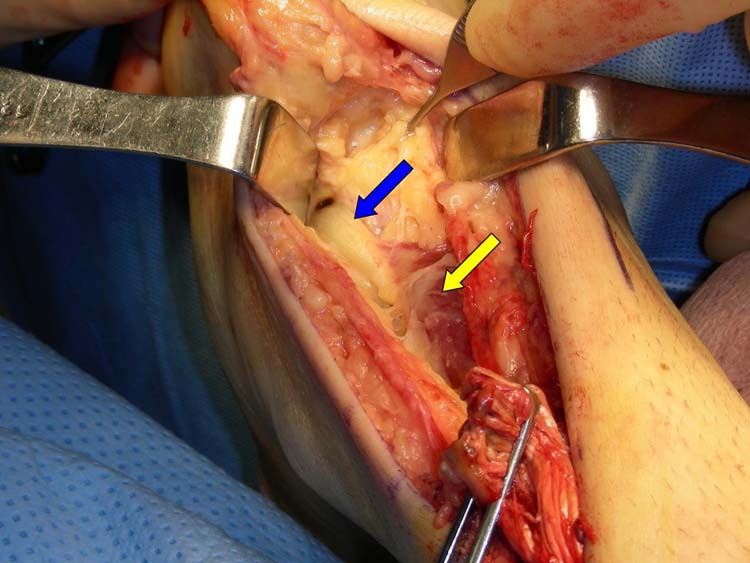 Note the free FHL tendon, highlighted by the yellow arrow, which is ready for transfer. Figure 4 The width of the tendon is measured to determine proper screw and tunnel diameter. Figure 5 Insertion of the reamer over the guide drill. Only the near cortex is drilled creating the “open” tunnel for interference screw placement. The far (plantar) cortex is often spared during reaming as this helps prevent formation of painful bone callus or creation of a stress fracture. 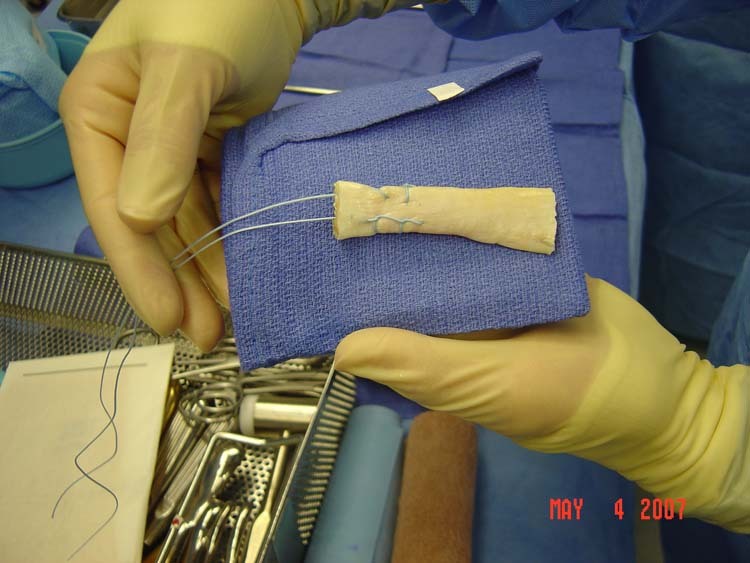 Figure 6 The free FHL tendon is secured with 2-0 Fiberwire™ and then harvested and passed through the tunnel and the suture is pulled out the plantar aspect of the heel. This may be performed with a tendon passer (yellow arrow) or looped through the slot in the drill (blue arrow). The last step is to secure the tendon with the screw utilizing the interference technique as described by Pearsall et al. First the Fiberwire™ exiting the plantar heel is pulled with the foot slightly plantarflexed. Care must be taken to ensure that the FHL tendon freely enters the open tunnel. While maintaining tension on the Fiberwire™ with the foot in a slightly plantarflexed position, the FHL tendon is then secured into the superior calcaneus with the Bio-Tenodesis™ screw. (Fig. 7) The screw must be inserted completely into the calcaneus. The remaining Achilles tendon is then attached to the FHL tendon with 2-0 Fiberwire™, once again maintaining physiologic tension. Figure 7 Insertion of interference screw: Notice that there is firm tension on the suture coming out the plantar heel. This will allow proper tension on the suture coming out the plantar heel. This will allow proper tension on the FHL tendon as the screw is inserted. The foot is kept in slight plantarflexion during this maneuver. After wound closure, the patient is placed into non-weightbearing posterior splint with the ankle plantarflexed to gravity equinus. The patient is typically kept non-weightbearing for four to six weeks followed by four weeks in walking cast with gradual increase in weightbearing and propulsion. After suture removal (typically at 2 weeks) the patient is then instructed to begin gently range-of-motion exercises at the ankle joint to begin applying mild tension on the healing Achilles tendon, transferred tendon, or graft. Neglected Achilles tendon ruptures have become a more common condition than in past decades and represent a difficult challenge for even the most experienced surgeon. Contrary to acute Achilles tendon ruptures, the evidence undoubtedly supports surgical treatment. However, the surgeon has the task of repairing a residual gap, restoring function, and preventing the many complications that commonly occur with Achilles tendon surgeries. Furthermore, a number of surgical and grafting techniques have been described, none of which has become the gold standard. We believe there are distinct advantages of the FHL tendon transfer compared to the alternative techniques. These advantages include 1) tendon harvesting through a single posterior incision , 2) the FHL provides plantarflexory power greater than that of the FDL, 3) it offers a rich vascular supply form its muscle belly, 4) it is less technically demanding than other procedures, 5) and has no significant deleterious effect on the normal biomechanics of the foot. In cases that have severe gaps and may require something more substantial than a tendon transfer, we believe the Achilles tendon allograft is a viable option either by itself or with FHL tendon transfer. It has similar strength to autografts and obviates the need for a donor site. It can, however, carry the risk of infectious transmission and takes longer to incorporate than autografts. Lastly, we also believe the OrthADAPT™ xenograft allows for an acellular matrix that is useful in reinforcing the FHL or allograft augmentation. We have found that many of the neglected Achilles tendon ruptures have absent or diseased paratenon at the site of injury. Therefore, after the repair, the OrthADAPT™ provides not only a matrix for the augmented repair to incorporate into, but also a temporary barrier, preventing adhesions postoperatively. We believe these techniques are an effective and practical method for surgical repair of neglected Achilles tendon ruptures. 1. Shalabi A: Magnetic Resonance Imaging in Chronic Achilles Tendinopathy. Acta Radiologica. Suppl 432:1-45, 2004. 2. Arner O, Lindholm A: Subcutaneous Rupture of the Achilles tendon. A study of 92 cases. Acta Chir Scand 239:7-51, 1959. 3. Cetti R, Christensen SE, Ejsted R, et al: Operative versus non-operative treatment of Achilles tendon rupture. A prospective randomized study and review of the literature. Am J Sports Med 21(6):791-799, 1993. 4. Habusta SF: Bilateral simultaneous rupture of the Achilles tendon. A rare traumatic injury. Clin Orthop Relat Res 320:231-234, 1995. 5. Nillius SA, Nilsson BE, Westlin NE: The incidence of Achilles tendon rupture. Acta Orthop Scand 47(1):118-121, 1976. 6. 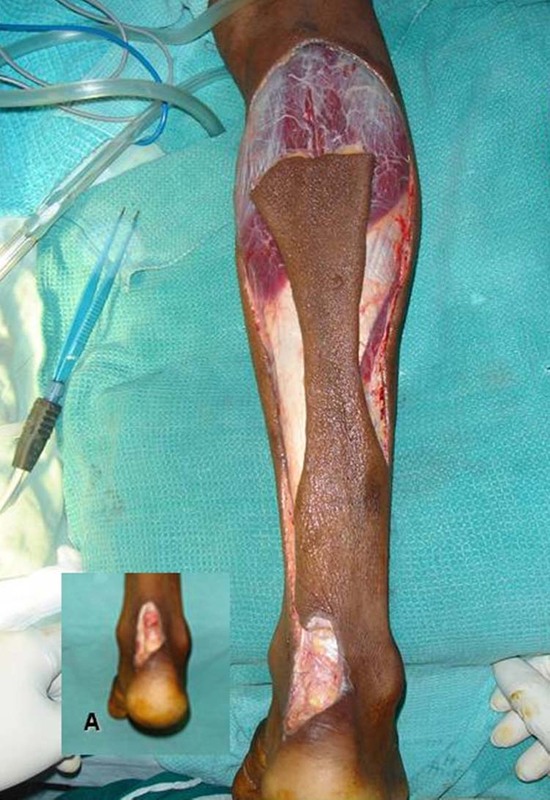 Nistor L: Conservative treatment of fresh subcutaneous rupture of the Achilles tendon. Acta Orthop Scand 47(4):459-462, 1976. 7. Maffulli N, Waterston SW, Squair J, et al: Changing incidence of Achilles tendon rupture in Scotland: a 15-year study. Clin J Sport Med 9:157-160, 1999. 8. Pintore E, Barra V, Pintore R, Maffulli N: Peroneus Brevis tendon transfer in neglected tears of the Achilles tendon. Journal of Trauma, injury, and critical care 50(1):71-78, 2001. 9. Leppilahti J, Orava S: Total Achilles Tendon Rupture: A review. Sports Med 25(2):79-100, 1998. 10. Jozsa L, Kvist M, Balint BJ, et al: The role of recreational sport activity in Achilles tendon rupture: a clinical, pathoanatomical, and sociological study of 292 cases. Am J Sports Med 17:338-43, 1989. 11. Shields CL, Jr, Kerlan RK, Jobe FW, et al: The Cybex II evaluation of surgically repaired Achilles tendon ruptures. Am J Sports Med 6(6):369-372, 1978. 12. Saxena A, Cheung S: Surgery for Chronic Achilles Tendinopathy. JAPMA 93(4):283-291, 2003. 13. Kvist M, Jozsa L, Jarvinen MJ, et al: Chronic Achilles paratenonitis in athletes: a histological and histochemical study. Pathology 19:1, 1987. 14. Wilcox DK, Bohay DR, Anderson JG: Treatment of chronic Achilles tendon disorders with flexor hallucis longus tendon transfer/augmentation. Foot Ankle Int 21(12):1004-1010, 2000. 15. Inglis AE, Sculco TP: Surgical repair of ruptures of the tendo Achilles. Clin Orthop Rel Res 156:160-169, 1981. 16. Acevedo, JI; Weber, KS; Eidelman DI: Technique tip: avoiding wound complications after neglected Achilles tendon repair using a tissue expansion technique. 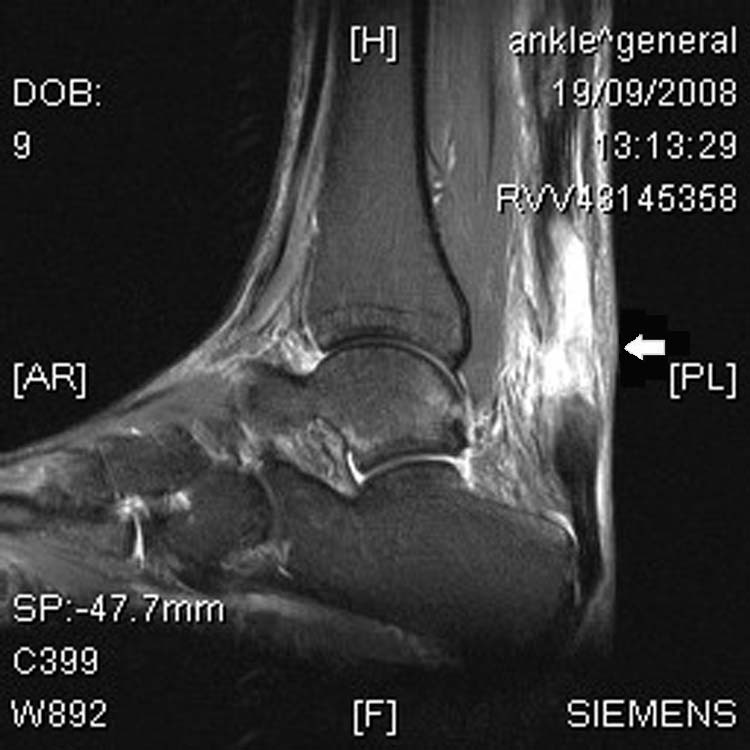 Foot & Ankle Int 28:393-395, 2007. 17. Paavola, M; Orava, S; Leppilahti, J; Kannus, P; Jarvinen, M: Chronic Achilles tendon overuse injury: complications after surgical treatment. An analysis of 432 consecutive patients. Am. J. Sports Med 28:77-82, 2000. 18. Fierro NL, Sallis RE: Achilles tendon rupture. Is casting enough? Postgrad Med 98(3):145-152, 1995. 19. DiStefano VJ, Nixon JE: Achilles tendon rupture: pathogenesis, diagnosis and treatment by a modified pullout wire technique. J Trauma 12:671-677, 1972. 20. Turco VJ, Spinella AJ: Peroneal Brevis Transfer. Foot Ankle 7(4):253-259, 1987. 21. Thompson TC, Doherty JH: Spontaneous rupture of tendon of Achilles: A new clinical diagnostic test. J Trauma 2:126-129, 1962. 22. GW, Griffith TG: Percutaneous repair of acute closed ruptured Achilles tendon: A new technique. Clin Orthop Relat Res 128:247-255, 1977. 23. Couglin MJ ed: Disorders of tendons. In Surgery of the foot and ankle 1149-1277, 2007. 24. Christensen I: Rupture of the Achilles tendon: analysis of 57 cases. Acta Chir. Scand 106:50-60, 1953. 25. Maffulli N. Clinical tests in sports medicine: more on Achilles tendon. Br J Sports Med 30:250, 1996. 26. Wong MWN, Sing VW: Modified flexor hallucis longus transfer for Achilles insertional rupture in elderly patients. Clin Orthop and Rel Res 431:201-206, 2005. 27. Simon SR, Mann RA, Hagy JL, Larsen LJ: The role of the posterior calf muscles in normal gait. J Bone Joint Surg 60A:465-472, 1978. 28. Bosworth DM: Repair of defects in the tendo Achilles. J Bone Joint Surg Am 38(1):111-114, 1956. 29. Gabel S, Manoli A 2nd: Neglected rupture of the Achilles tendon. Foot Ankle Int 15(9):512-517, 1994. 30. Porter DA, Mannarino FP, Snead D, et al: Primary repair without augmentation for early neglected Achilles tendon ruptures in the recreational athlete. Foot Ankle Int 18(9):557-564, 1997. 31. Miskulin M, Miskulin A, Klobucar H, Kuvalja S: Neglected rupture of the Achilles tendon treated with peroneus brevis transfer: a functional assessment of 5 cases. Journal of Foot Ankle Surg 44(1):49-55, 2005. 32. 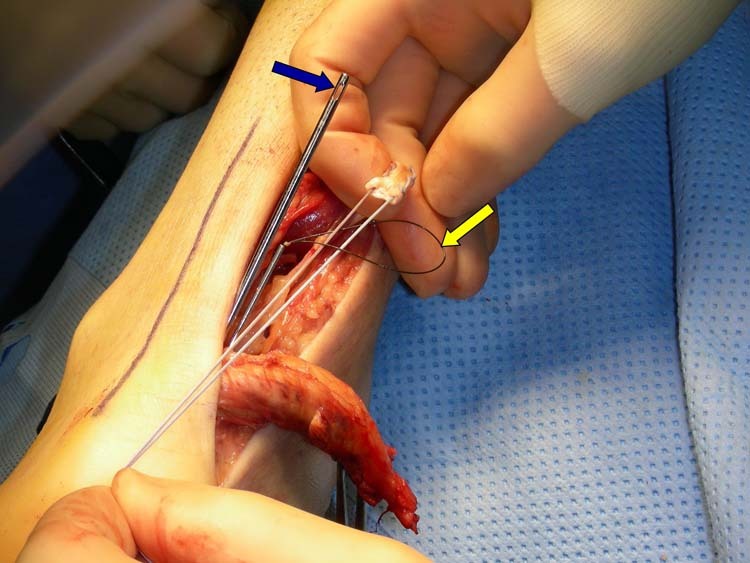 Wapner KL, Hecht PJ, Mills RH Jr: Reconstruction of neglected Achilles tendon injury. Orthop Clin North Am 26(2):249-263, 1995. 33. Howard CB, Winston I, Bell W, Mackie I, Jenkius DHR: Late repair of the calcaneal tendon with carbon fiber. J Bone Joint Surg 66B:206-209, 1984. 34. 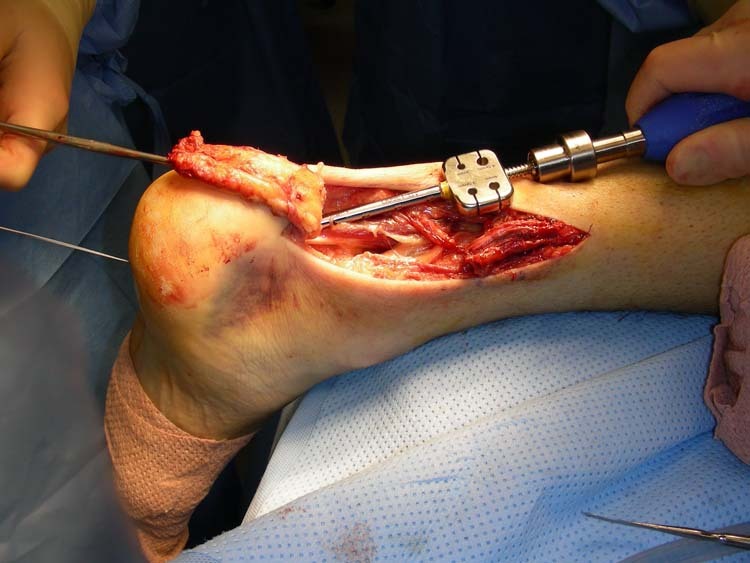 Besse JL, Lerat JL, Moyen B, Brunet-Guedj E: Achilles tendon repair using a bone-tendon graft harvested from the knee extensor system: Three cases: JFAS 38(1):70-74, 1999. 35. Barnes MJ, Hardy AE: Delayed reconstruction of the calcaneal tendon. J Bone Joint Surg Br 68(1):121-124, 1986. 36. 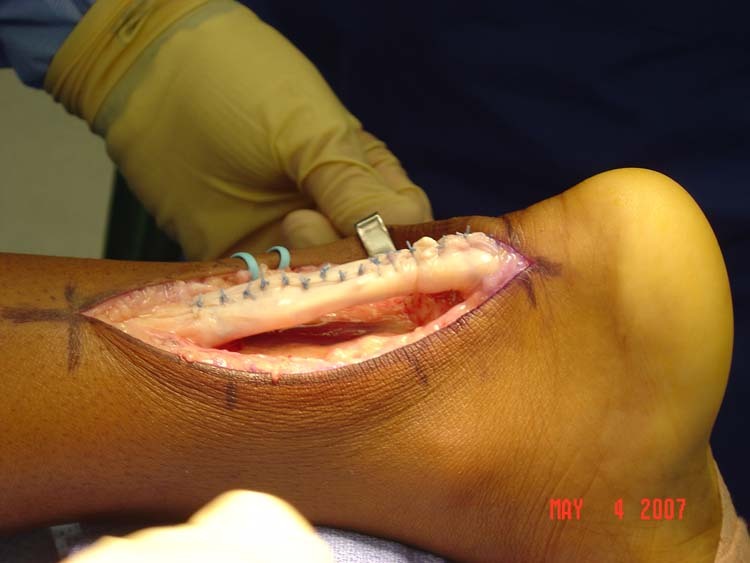 Nistor L: Surgical and non-surgical treatment of Achilles tendon rupture. A prospective randomized study. J Bone Joint Surg Am 63(3):394-399, 1981. 37. Lead RB, Smith L: Non-surgical treatment of tendo Achilles rupture. J Bone Joint Surg 54A:1398-1407, 1972. 38. Mann RA, Holmes GB Jr, Seale KS, Collins, DN: Chronic rupture of the Achilles tendon: A new technique of repair. J Bone Joint Surg Am 73(2):214-219, 1991. 39. Carden DG, Noble J, Chalmers J, et al: Rupture of the calcaneal tendon. The early and late management. J Bone Joint Surg Br 69(3):416-420, 1987. 40. Kocabey Y, Nyland J, Nawab A, Caborn D: Reconstruction of Neglected Achilles’ tendon defect with peroneus brevis tendon allograft: A case report. Journal Foot Ankle Surg 45(1):42-45, 2006. 41. Helgeland J, Odland P, Hove LM. Achilles tendon rupture. Surgical or non-surgical treatment, Tidsskr Nor Laegeforen 117:1763-1766, 1997. 42. Saltzman CL, Tearse DS: Achilles tendon injuries. J Am Acad Orthop Surg 6:316-325, 1998. 43. Boyden EM, Kitaoka HB, Cahalan TD, An K: Late versus early repair of Achilles tendon rupture. Clin Orthop 317:150-158, 1995. 44. Bugg EI Jr, Boyd BM: Repair of neglected rupture or laceration of the Achilles tendon. Clin Orthop Relat Res 56:73-75, 1968. 45. Hansen S: Trauma to the heel cord. In Jahss M (ed), Disorders of the Foot and Ankle: Medical and Surgical Management, ed. 2. Philadelphia, WB Saunders, 1991, pp 2355-2360. 46. Myerson MS: Achilles tendon ruptures. In AAOS Instructional Course Lectures, 48:219-230, 1999. 47. Wapner KL, Pavlock GS, Hecht PJ, et al: Repair of chonic Achilles tendon rupture with flexor hallucis longus tendon transfer. Foot Ankle 14(8):443-449, 1993. 48. Abraham, E; Pankovich, AM: Neglected rupture of the Achilles tendon. J. Bone Joint Surg 57A:253-255, 1975. 49. 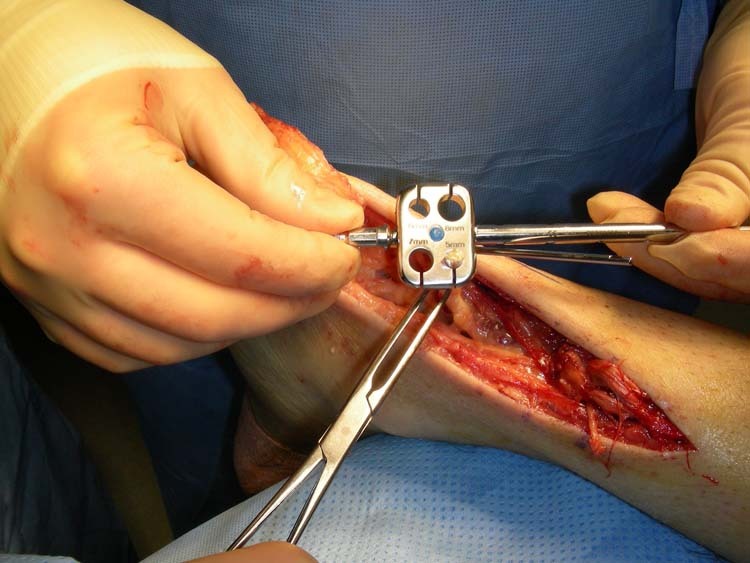 Dalton, G; Wapner, K; Hecht, P: Complications of Achilles and posterior tibial tendon surgeries. Clin. Orthop 391:133-139, 2001. 50. Christensen RE: To tilfaelde of subcutan Achillessenenrupture. Dansk Kir. Selsk. Forh 75:39, 1931. 51. Jessing P, Hansen E: Surgical treatment of 102 tendo Achilles ruptures—suture or tenontoplasty? Acta Chir Scand 141:370-377, 1975. 52. Dalton G: Achilles tendon rupture. Foot Ankle Clin 1:225-236, 1996. 53. Maffulli N, Leadbetter WB: Free Gracilis tendon graft in neglected tears of the Achilles tendon. Clin J Sport Med 15(2):56-61, 2005. 54. Ralston E, Schmidt E: Repair of ruptured Achilles tendon. J. Trauma 11:15-21, 1971. 55. 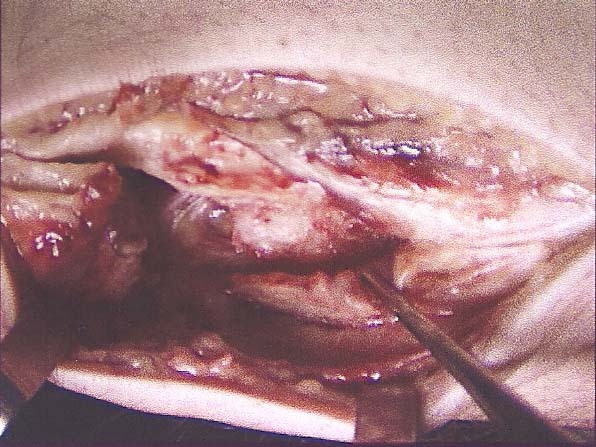 White RK, Kraynick BM: Surgical uses of the peroneus brevis tendon. Surg Gynecol Obstet 108(1):117-121, 1959. 56. Teuffer AP: Traumatic rupture of the Achilles tendon. Orthop Clin N Am 5:89-93, 1978. 57. Clarke HD, Kitaoka HB, Ehman RL: Peroneal tendon injuries. Foot Ankle Int 19:280-288, 1998. 58. Den Hartog BD: Flexor hallucis longus transfer for chronic Achilles tendinosis. Foot Ankle Int 24(3):233-237, 2003. 59. Tashjian RZ, Hur J, Sullivan RF, Campbell JT, DiGiovanni CW: Flexor hallucis longus transfer for repair of chronic Achilles tendinopathy. Foot Ankle Int 24(9):673-676, 2003. 60. Pearsall AW, Bryant GK: Technique tip: A new technique for augmentation of repair of chronic Achilles tendon rupture. Foot Ankle Int 27(2):146-147, 2006. 61. Carr AJ, Norris SH: The bood supply of the calcaneal tendon. J Bone Joint Surg 71B:100-101, 1989. 62. Martin RL, Manning CM, Carcia CR, Conti SF: An outcome study of chronic Achilles tendinosis after excision of the Achilles tendon and flexor hallucis longus tendon transfer. Foot Ankle Int 26(9):691-697, 2005. 63. Monroe MT, Dixon DJ, Beals TC et al: Plantarfelxion torque following reconstruction of Achilles tendinosis or rupture with flexor hallucis longus augmentation. Foot Ankle Int 21:324-329, 2000. 64. Coull R, Flavin R, Stephens MM: Flexor hallucis longus tendon transfer: Evaluation of postoperative morbidity. Foot Ankle Int 24(12):931-934, 2003. 65. Lieberman JR, Lozman J, Czajka J, Dougherty J: Repair of Achilles tendon rupture with Dacron vascular graft. Clin. Orthop 243:204-208, 1988. 66. Parsons JR, Weiss AB, Schenk RS, et al: Long-term follow-up of Achilles tendon repair with an absorbable polymer carbon fiber composite. Foot Ankle 9(4):179-184, 1989. 67. Schedl R, Fasol P: Achilles tendon repair with the plantaris tendon compared with repair using polyglycol threads. J Trauma 19:189-194, 1979. 68. Ozaki J, Fujiki J, Sugimoto K, et al: Reconstruction of the neglected Achilles tendon rupture with Marlex mesh. Clin Orthop Relat Res (238):204-208, 1989. 70. Nellas ZJ, Loder BG, Wertheimer S: Reconstruction of an Achilles tendon defect using Achilles tendon allograft. J Foot Ankle Surg 35:144-148, 1996. 71. Takao M, Ochi M, Naito K, Uchio Y, Matsusaki M, Oae K: Repair of neglected Achilles tendon rupture using gastrocnemius fascial flaps. Arch Orthop Trauma Surg 123:471-474, 2003. 72. Amis AA, Campbell JR, Kempson SA, Miller JH: Comparison of the structure of neotendons induced by implantation of carbon or polyester fiber. J Bone Joint Surg 66B:131-139, 1984. 73. Poehling GG, Curl WW, Lee CA, Ginn TA, Rushing JT, Naughton MJ, Holden MB, Martin DF, Smith BP: Analysis of Outcomes of Anterior Cruciate Ligament Repair with 5-Year Follow-Up: Allograft versus Autograft. Arthroscopy 21(7):774-85, 2005. 74. Nellas ZJ, Lorder BG, Wertheimer SJ: Reconstruction of an Achilles tendon defect utilizing an Achilles tendon allograft. J Foot Ankle Surg 35:144-48, 1996. 75. Yuen JC, Nicholas R: Reconstruction of a total Achilles tendon and soft-tissue defect utilizing an Achilles allograft combined with a rectus muscle free flap. J Plast Reconstr Surg 107:1807-1811, 2000. 76. 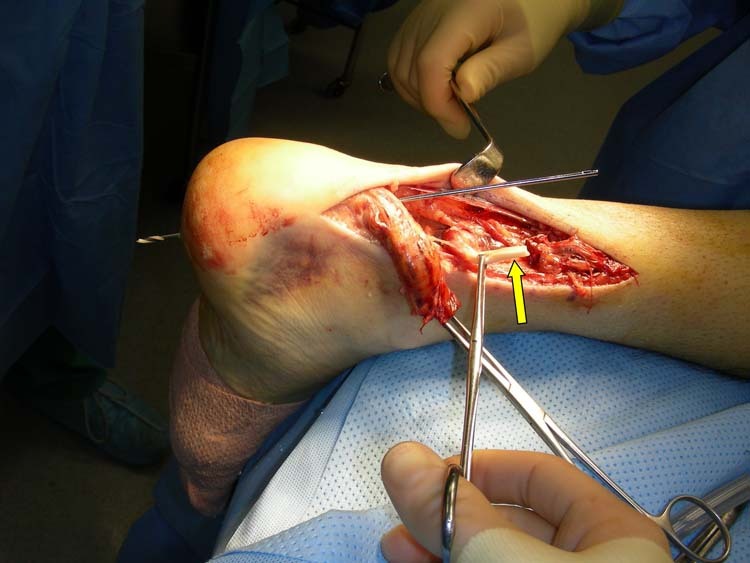 Lepow GM, Green JB: Reconstruction of a Neglected Achilles Tendon Rupture with an Achilles Tendon Allograft: A Case Report 45(5):351-55, 2006. 77. 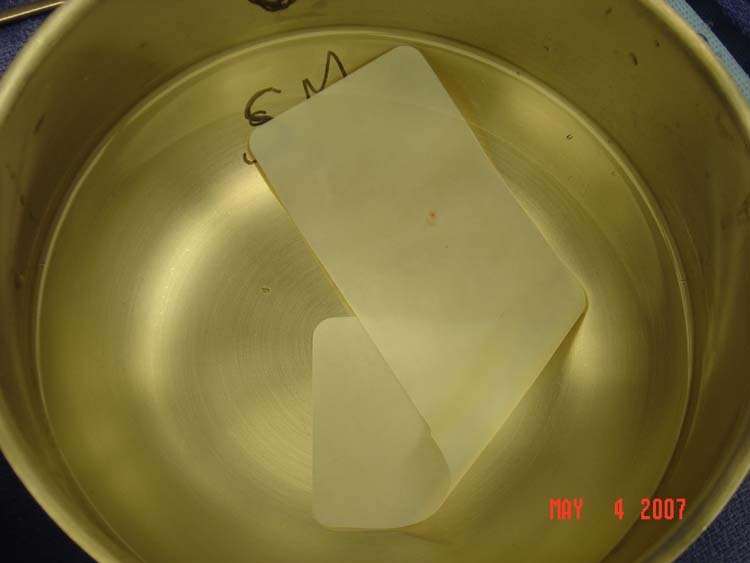 Mahirogullari M, Ferguson CM, Whitlock PW, Stabile KJ, Poehling GG: Freeze-Dried Allografts for Anterior Cruciate Ligament Reconstruction 26:625-37, 2007. 78. Yasuda T, Kinoshita M, Okuda R: Reconstruction of Chronic Achilles Tendon Rupture with the use of interposed tissue between the stumps. American Journal of Sports Medicine 35(4):582-588, 2007. 1Senior Resident, Kaiser Permanente/Cleveland Clinic Foundation Residency Program, Cleveland, Ohio.